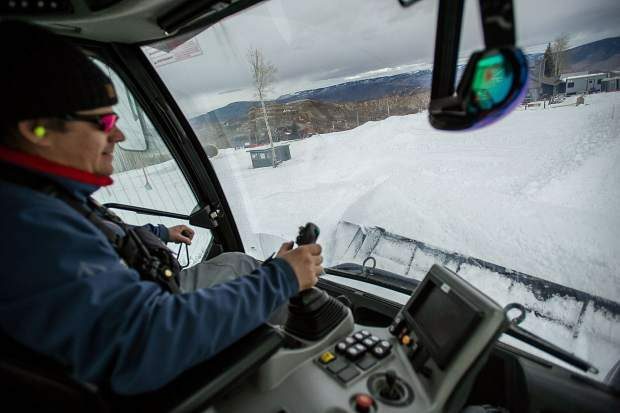 Yannick Rioux, the Snowmass terrain park manager, pushes snow with a snowcat on Saturday for the superpipe being built for the U.S. Grand Prix competition this week. When spectators arrive at the staging area for this week’s Toyota U.S. Grand Prix in Snowmass, they’ll see perfection. From the 22-foot halfpipe to the manicured slopestyle course, it’ll be a work of art any skier or snowboarder can admire. What won’t be obvious is the painstaking amount of hours it took the crew to build it and just how close it was to not happening at all. Lindsay, a lifelong local and former Aspen Valley Ski and Snowboard Club coach, will serve as the chief of competition for this week’s Grand Prix, which is the second-to-last stop to determine who makes the Olympic teams for the United States in men’s and women’s ski and snowboard halfpipe and slopestyle. The competitions also are part of the World Cup circuit and will bring in the biggest names the sports have to offer. While many of these athletes make the annual pilgrimage to Buttermilk for X Games Aspen, this will be the first time Snowmass has hosted an event of this magnitude since 1998. Summit County teen Red Gerard, one of the biggest up-and-coming names in halfpipe snowboarding, has come to Snowmass the past couple of years for private sessions with TransWorld SNOWboarding. Canadian superstar Mark McMorris landed the first-ever triple cork 1440 in the Snowmass terrain park back in 2011. For the locals, Snowmass has always been a popular spot. As of Saturday, the Snowmass crew was still putting together the final pieces. The halfpipe, built by Summit County’s Jake Ingle — who will be part of the crew to also build the Olympic halfpipe in South Korea next month — wasn’t yet ready to ride. The slopestyle course, which runs parallel to the halfpipe, was better off, although the crew was still tweaking parts and cutting corners for the television aesthetics. Athlete training is scheduled to take place Monday and Tuesday. Colorado’s general lack of snow so far this winter has certainly been a burden for the Snowmass crew, although Rioux said most of the snow used in making the halfpipe and slopestyle course was going to be manmade anyway. However, with temperatures often soaring above 40 degrees during the day in recent weeks, they haven’t been able to make nearly as much snow as they would like. This has led to quite the rush at the end to get everything ready for this week’s competition. As of Sunday night, everything looked to be full go for Monday’s first training sessions. The snowboard halfpipe and skiing slopestyle training for men and women is scheduled for 8:30 to 11:30 a.m. Monday, with the ski halfpipe and snowboard slopestyle session going from noon to 3 p.m. The training sessions will flip on Tuesday. The Snowmass park is located just up from the Spider Sabich Picnic arena and can be accessed via the Village Express lift — get off at the midway point — or the Coney Glade lift. The Coney Glade lift takes passengers right over much of the course. Athletes going off the slopestyle jumps are expected to reach heights well above the lift itself. Spectating is free, although a ticket will be needed to access the lifts. Qualifying gets underway Wednesday for ski halfpipe and snowboard slopestyle. Thursday qualifiers are for snowboard halfpipe and ski slopestyle. Finals are scheduled for Friday and Saturday, with a second ski slopestyle competition — qualifying and finals — scheduled for Sunday. The second competition is to make up for a canceled Olympic qualifier last winter in Mammoth. NBC and NBC Sports will televise the finals.